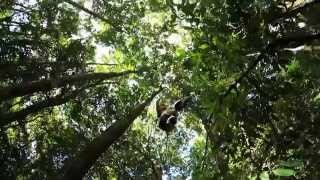 Get the best service and rates by dealing direct with Jungle Surfing Canopy Tours. 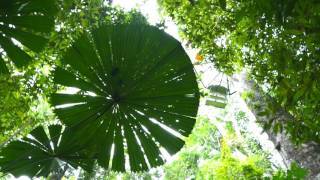 Then join us on a guided zipline tour through the Daintree Rainforest. One of Queensland’s “must do” experiences, Jungle Surfing Canopy Tours are set on a private rainforest reserve in Cape Tribulation, a scenic 2 hours’ drive from Port Douglas and 3 hours from Cairns. 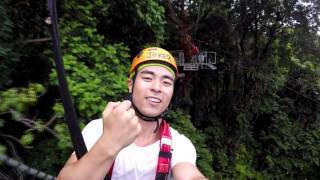 Our multi award-winning tours takes you on a unique zipline experience where your feet don’t touch the ground! The Jungle Surfing experience consists of a series of five eco-friendly platforms and six flying fox ziplines that gives you extraordinary access to the canopy of the ancient Daintree Rainforest. The platforms range from 7 to 16 metres above the ground and each one reveals different layers of the rainforest. The tour starts with the “Human Hamster Wheel”, our ingenious and interactive winch used to propel your small group of jungle surfers from the ground up to the first tree platform. Then you’ll glide through the canopy with 360 degrees views over the treetops, down to cascading streams and out to the Great Barrier Reef. The ziplines range from 37-95m and are travelled in pairs except for one solo flight across a rainforest creek – upside down if you dare! The final span to the ground features side-by-side racing ziplines with speeds over 45km/h or you can choose to take the whole thing slow and steady. Don’t forget your camera as there are some incredible photo opportunities up in the trees. Our expert guides accompany you every step of the way controlling all equipment and flight so there’s no experience or tuition necessary. And throughout the tour, the guides tell the fascinating story of world’s oldest rainforest. The two-hour Jungle Surfing tour runs in all weathers with at least one hour up in the rainforest canopy. The tour is suitable for all ages from 3 to 103! Tours depart up to twelve times a day from Cape Tribulation or you can join action-packed full day tour from Cairns, Northern Beaches and Port Douglas. Check-in for all Jungle Surfing tours is at the Jungle Adventure Centre (JAC), and we offer courtesy transfers to the JAC from accommodation around Cape Tribulation. THE DAINTREE IS NOT KNOWN FOR ITS NIGHTLIFE. BUT THE SECRET IS, IT’S ALL GOING ON WITHOUT YOU. When the sun sets and all the surfers have gone home, those who only come out at night start dancing in the dark. Our guided night walks allow you to indulge your inner Attenborough and tune into all your senses – free from the shackles of technology – to discover what lies beneath the blanket of darkness. Our two hour walk follows natural trails over uneven ground and therefore requires moderate fitness and comfortable walking shoes. Jungle Adventures Night Walks are not recommended for children under 8 years, however we do offer private nightwalks for families with young children, tailored to your requirements and subject to availability. Please contact us to make an enquiry. 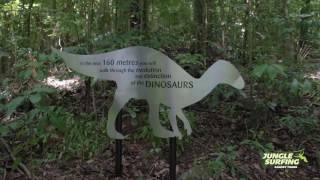 This is Cape Tribulation in the Daintree Rainforest, only a few hours’ drive north from Port Douglas and Cairns. A living museum where two UNESCO World Heritage Listed areas collide, creating nature’s own spectacular, high-definition live stream, and Jungle Surfing is the best way to explore it from every angle. – Group, exclusive and private tour rates are available – please contact us direct for details. Look who is in town doing a zipline tour with us, it’s Aislin Kriukelis from the TODAY Show . We had a great time showing her around the rainforest canopy. Thanks Aislin for being such a great sport . Did you know that having a dragonfly land on your head is considered good luck?! Buzzing around the Daintree, you may bump into this little fella. This Dragonfly was spotted on a bush walk in the Daintree by Daniel Miller. Your guests can now take a time warp back to the beginning of time when they visit Jungle Surfing Canopy Tours. The journey starts with the origin of life and step's its way through 500 million years of evolution. Teaching about prehistoric flora and fauna, what really happened to the dinosaurs and the theory of the big bang before winding its way through ancient rainforest, concluding the journey at Human Hamster Wheel - the first of its kind in the world! Had a great day today with my partner. Seen the rainforest in a totally different way instead of seeing from the ground. The guys Noel, Ben and James were great and were very knowledgeable. Would highly recommend to anyone. We had such a fabulous morning Jungle Surfing. All the staff were the best and made it such a fun experience. Plenty of laughs, magic views and a great family activity. I will definitely be recommending this to all our visitors. Honestly had the best time today with the group and the instructors. Was such a fun and relaxed vibe and all the instructors had a sense of humour. Will definitely be coming back and recommending to my friends. Cheers, Hermione Granger, aka swiss, aka Fiona.